You're not supposed to wear black during the summer. Right? Well, not exactly. If you're anything like this editor, avoiding the dark hue altogether for three months is not an option. C'mon, black is just chic. Period. And it appears some of our favourite celebs agree. Below, we're highlighting how A-listers like Victoria Beckham, Gigi Hadid, Olivia Palermo, and more are wearing (and pulling off without overheating!) black this summer. Keep scrolling for primo style (and shopping!) advice. Feeling the unbearable heat out there but just unable to give up your slimming black pieces? Gigi Hadid knows what's up, with an easy tank and breathable leggings. We love her trick of rolling up one side of the top for extra breathing room. On Hadid: Blue Life Fit Zipper Moto Leggings ($175); Max Mara Whitney Small Leather Tote Bag ($1150); Adidas Originals Superstar Sneakers ($56). On those crazy-hot nights when you don't want to wear your standard LBD, take Daisy's lead and go for a lace frock instead. 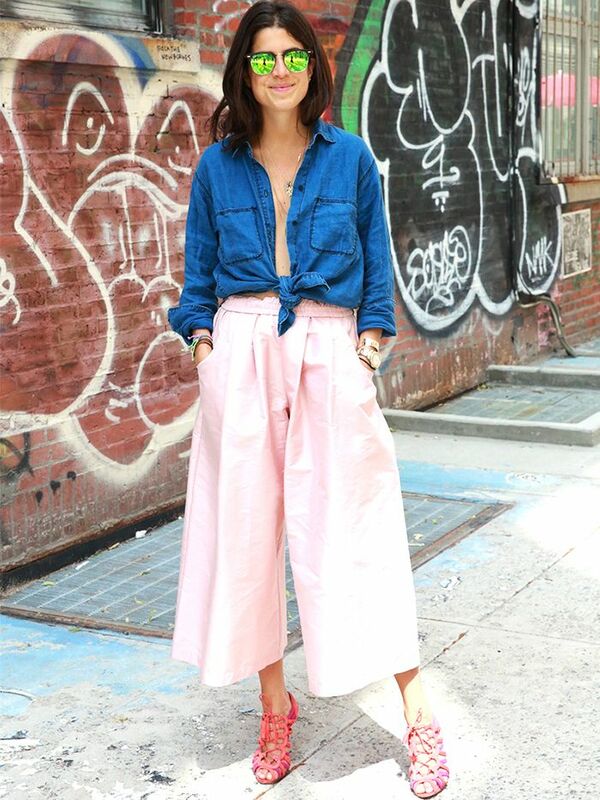 And don't be afraid of showing your undergarments—it totally works and is incredibly fashion forward right now. The best way to make thicker black pieces work for the summer months is to find items that have cutout details that let extra air in. Case in point: Olivia Palermo's sweater with cutout shoulders. Her strappy black sandals and cropped pants also work well in the heat. On Palermo: Hayward Foldover Tote ($3195) in Natural Python; Capwell Silver Bar Collar Necklace ($42); Westward Leaning Project Vanguard 12 Sunglasses ($225); Schutz Juliana Caged Sandals ($190). If you're looking for a simple, cool, yet totally chic ensemble, turn to Kendall Jenner for inspiration. A black tank tucked into skinnies with black accessories is easy—but insanely stylish. On Jenner: 3x1 jeans; Givenchy bag; B-Low the Belt belt; Saint Laurent Santiag Western Boots ($837). On those chillier June mornings (when you know the heat is coming by noon), layering is key. Toss a black jacket over black separates (like Victoria Beckham's top and printed pants—a great way to break up solid black). On Beckham: Victoria Beckham Floral Stretch-Jacquard Skinny Pants ($798); Victoria Beckham jacket and clutch; Casadei pumps. What do you think? Do you still wear black in the summer? Sound off in the comments below!